Hive is a productivity platform for seamless project management and collaboration. 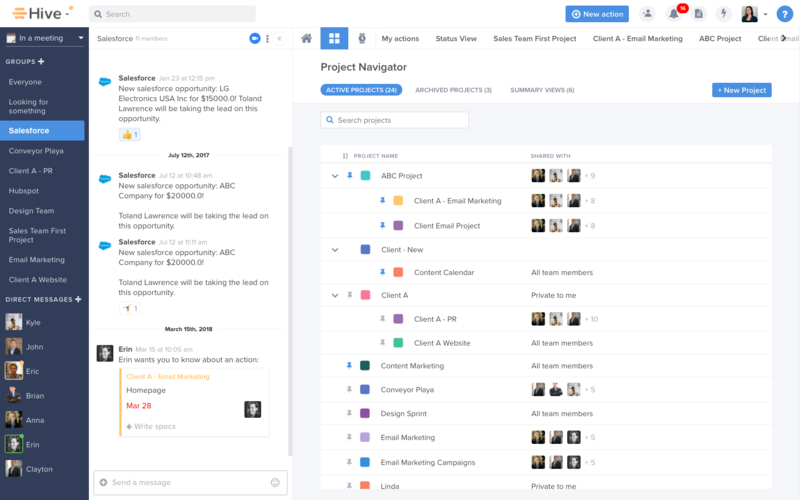 By connecting people, tasks, data, and 1000+ integrations, Hive delivers workflow management and AI-powered insights for enterprises and startups alike. Hive provides the flexibility for every individual on the team to work the way that best suits them. With multiple project layouts including Gantt charts, Kanban boards, calendars, and tables, each team gets the flexibility needed while still having the benefit of a centralized platform. Hive works to save businesses time and money by leveraging existing data and machine learning to figure out each team works. Hive Analytics interactive dashboards provide actionable insights into team productivity. This enables users to spot where inefficiencies are, and what changes could improve productivity and utilization. With real-time notifications powered by machine learning, users will be immediately alerted to anomalies in the team’s productivity. This ensures on-time projects and prevents an overbooked team. Still not sure Hive is right for you? Use our Product Selection Tool to compare other Project Management Software solutions. Have questions? Call one of our unbiased Technology Advisors for a free consultation. Learn everything you need to know about Hive. Our experts will reach out to you shortly.